log at program startup when no temporary rules are found. making impossible to activate the program.
. Updated: New logging entries were added in the program for debugging purposes. Что выбрать этот или Windows7 Firеwall Control? Отличие в том, что Windows7 Firеwall Control самостоятельная программа и может работать и без Брандмауэра Window а этот надстройка к родному фаерволу. ...плюс Windows7 Firеwall Control, несмотря на свое название, имеет версию и для XP. Сейчас кстати, он уже будет называться Windows8 Firеwall Control, беты уже под этим названием. У сабжа, ИМХО, одно преимущество - нативное лечение. Функционал же примерно одинаковый. Этот сабж не советую новичкам, сторонний фаер можно всегда удалить если что, а этим можно так родной файер настроить что потом отвалится все насвете, причем выход из программы не поможет. У меня например в режиме Средняя фильтрация отвалилась локалка, при выходе из программы не работает, но зато когда переключаюсь в режим низкой фильтрации все работает нормально. За пару дней пользования могу сказать что прога классная, однозначно пока оставляю, но с ней нужно иметь понимание и уметь создавать правила. Если нужна прога поставил включил забыл то однозначно эта не для вас. Хотя и в брандмауре всегда можно поставить настройки по умолчанию. Подскажите мне - как русский язык установить в ней? В чем отличие этих двух строк, поясните, пожалуйста. be enabled from the data grid header context menu. wants to disable Windows Firewall logging at uninstallation. button in Recently Blocked window. reloaded at reopening of the view. This applies to Manage Rules and Recently Blocked. are created on non en-US versions of Windows. Windows Store on Windows 8 machines. denies this. "System" is not included in the rules defined for All programs. a command with a large output, the window can't be scrolled up to see the results. Первая по умолчанию Windows, а вторая по умолчанию разработчика BiniSoft. Тут дело в даверии , либо к макрософаку, либо к BiniSoft. ну у макрософта ничего не добавлено, а у бини всякие хост процессы самой системы и т.д. New: Added Local Addresses field in Manage Rules window. Useful for scenarios in which exist multiple network adapters on the same machine. Updated: The Properties dialog from where a rule can be modified was changed and rearranged into only one tab to see all properties in the same place. Updated: The recommended rule for Windows Update does work anymore because Windows Update uses a different service for checking for updates. It was updated with a generic rule for svchost.exe that will allow Windows Update. Fixed: Notification dialog is displayed out of screen if it is closed in a secondary screen and the screen is not connected anymore. Now, if a window or dialog from WFC contains at least one pixel out of the active screens, the default location will be restored. This applies to all WFC windows and dialogs. Removed: The self signed certificate was removed. Because of this certificate, a lot of connections were generated by the operating system to VeriSign and Microsoft servers in the name of wfc.exe and wfcs.exe. The connections were made to check the validity of the certificate by the operating system not by WFC, but a lot of users were concerned about WFC connection attempts which was not the real case. - Updated: Properties dialog from where a user can modify a rule is now resizable. Also, the position and state is saved on closing. - New: Added a new “Reset sorting” menu item in the data grid header context menu for Manage Rules window. This will reset aany sorting on any column and will restore the default state without any sorting active. “-cp” – Launches the Control Panel window. “-mr” – Launches the Manage Rules window. - Fixed: Manage Rules window sometimes does not restore properly to the last state if the the window was closed in Maximized state. 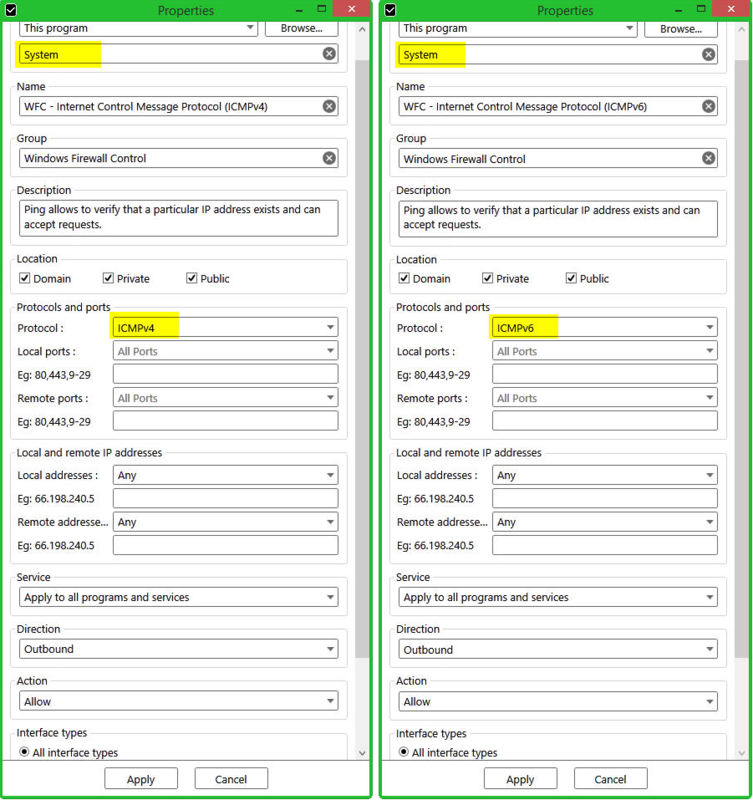 - Fixed: The validation rules for IPv6 addresses were updated and the rules that contain IPv6 addresses as remote addresses or local addresses will be valid when a rule is modified and contains IPv6 parameters. context menu on the selection. You will see a new entry named "Export selected rules". while the existing rules will remain unchanged. the "-reset" parameter to clean any stored user settings. unresponsive. A new busy indicator was added to show that something is going on. the profile is not updated correctly in the Profiles tab. creates new rules for multiple files at a time by browsing them. multiple rules have the same internal hash. Switched to Guid instead of Hash. - Improved: It is now possible to do multiple tasks at once in Manage Rules window. disabled. Now, multiple long running tasks can be executed in the same time. the user to identify more easily what kind of file he will import. something else, for example only Domain. possible to create a second rule until you don't refresh again the list. to search for executable files, the search does not start automatically. import a policy file, even if the file was not valid and nothing changed. to a specific protocol but custom remote ports or remote addresses are not defined. resets to "Block all connections to apps that are not on the list of allowed apps"
when the user changes the Profiles in Windows Firewall Control. displayed in the bottom right corner of the screen. - Improved: New logging points were added in the software for debugging purposes. P.S. подскажите, в портативном варианте бывает? user hovers the moue over the icon of the program that was blocked. that a rule can't be created even if it is created. open, the rules list does not refresh automatically.